When I was growing up, we didn’t often travel too far from home. There were picnics and day trips but most excursions were of short distance and duration. I mostly grew up in Birmingham but when Dad’s work began to transfer us fairly regularly we moved around a lot; most of the moves were fairly close to home: Jackson, Nashville, Tuscaloosa. The lengthier vacations were usually to Panama City, Florida, on the Gulf. My Journey grandparents had a fishing cottage on the Black Warrior River in Walker County, not far from Birmingham, and my Harbison grandparents had a weekend place on their farm land in Cullman County near Smith Lake, about an hour away. There were occasional trips to New Orleans, Atlanta. Montgomery, and we often went on overnight business trips with Dad to nearby towns. The bulk of the travel was within a 350-mile radius of wherever we lived at the time. I wasn’t widely-travelled, but I had limitless wanderlust. In that heyday of magazines, my family’s magazine rack was always full. I was a voracious reader from an early age and I would read anything in the house from cover to cover whether it matched my interests or not. My Granddaddy Harbison raised hunting hounds and subscribed to The Hunter’s Horn, a magazine about hunting and hounds; I avidly read that also, even though I had no interest in hunting and my only hound was a pet beagle named Spotty with an ear-splitting bark back when I was in elementary school. Any book was fair game. I was lucky enough to have parents who encouraged and never censored my reading and I attribute much of the success of my education to my reading habits. I would walk in a room and instantly sit with my face buried in a book. My teenage nephew now does much the same with his electronic gadgets and I’m hoping that is enhancing his knowledge the way printed matter enhanced mine. In every magazine I read, I was particularly attentive to the travel ads. If there was a coupon to order a travel guide I would carefully clip it and send it to the address that was advertised. So, even though I wasn’t widely-travelled in my actual life, I would sit for hours and ponder travel guides that took up a full drawer in my bedroom dresser. Through those printed guides I travelled the length and breadth of the country and the world. On my first trip to New York City, friends tried to surprise me by pointing out landmarks and asking if I knew what that building was, what that church or museum was, what park I was entering. I always knew the answer from reading books and magazines and watching movies. It all felt familiar even if I was seeing it live in person for the very first time. In one 1960s South Dakota travel guide my youthful imagination was captured by an image of something called the “Corn Palace” in Mitchell, South Dakota (www.cornpalace.com). It was a multi-use municipal auditorium such as most communities built in the early twentieth century. What set it apart was its Moorish-style adornment with onion domes and minarets. 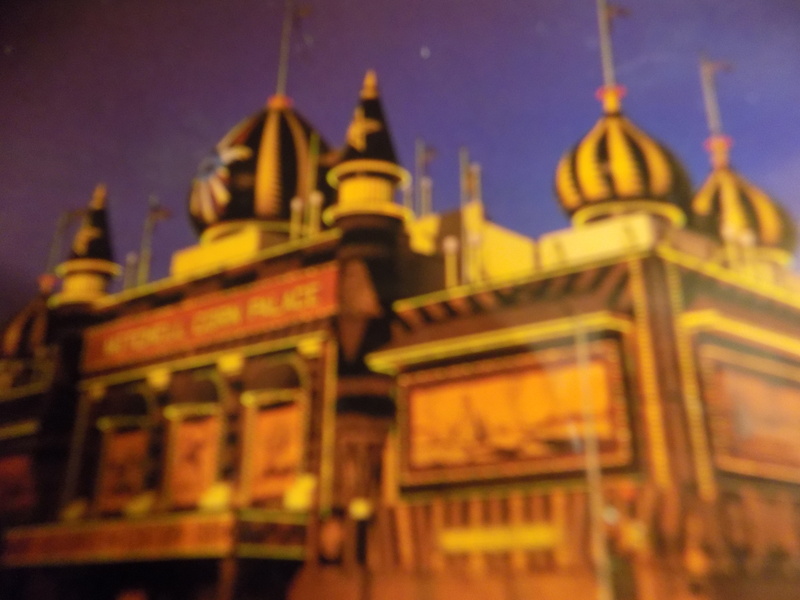 Most exciting of all was that the Corn Palace sprang from a turn of the century movement of building “crop palaces” throughout the Great Plains. Mitchell’s iteration of this trend was entirely covered with corn murals. I vowed then and there that if I ever found myself in South Dakota I would have to make a pilgrimage to Mitchell’s Oz-like Corn Palace. Over time I grew out of my childhood travel guide obsession and eventually cleared my drawers of the books and brochures. Fast forward to 1989 and I am hired by Omaha’s Nebraska Theatre Caravan to stage manage their east coast tour of A Christmas Carol. Even though it was billed as an East Coast tour, our show had to get from Omaha to the East and tour dates were scheduled along the way in South Dakota, Iowa, Illinois, and Ohio. Looking over the itinerary in a phone conversation with one of the Playhouse staff, I was told we would play Mitchell, South Dakota. I stopped her immediately. “Are we by any chance playing the Corn Palace in Mitchell?” She said we were – did I know the Corn Palace? I told her that indeed I did and that I had planned to visit it for years. She was amused that someone in Alabama had a mission to visit the Corn Palace. Mitchell was one of our first stops on the tour and we drove there from a gig in tiny Sioux Center, Iowa. We arrived on Mitchell’s main street just at sunrise on a bitterly cold November Sunday morning. I was driving and most of the technical crew in the van was sleeping. I caught a glimpse of sunlight glinting off an onion dome a couple of blocks away and knew that my childhood goal had been reached. I shouted “There it is!” and woke several crew members who did not share my enthusiasm and were annoyed that their sleep was interrupted. We were early for our load-in and had time to go grab breakfast. But first, one of our tour crew took pictures of me standing in front of the Palace. I know those photos are stored away somewhere but I haven’t been able to find them for years. All I can find are blurred photos of the Palace taken as we were leaving town that night and of a mural inside the auditorium. The Corn Palace continues to be a busy venue, I hear. Our show followed a Barbara Mandrell performance the night before. Mitchell is a small town but the great local crew was I.A.T.S.E. union members and I found out that many of the union guys were also local farmers, at least one of whom provided the corn for the murals. The Palace’s exterior murals have an annual theme which changes each year so the façade of the building takes on a whole new look from year to year. The crows were having a field day on the façade of the Corn Palace. Our show was on Sunday afternoon and we didn’t spend the night in Mitchell so I spent as much of my break time as I could exploring the unique roadside attraction appeal of the facility and the town. As we reboarded the crew van and set off for Des Moines, I vowed to return to Mitchell and the Corn Palace some day when I had more time to absorb the unique local vibe. I haven’t returned yet but when friends tell me they’re going anywhere near South Dakota I always implore them to take the detour into Mitchell and gawk at what bills itself as “The World’s Only Corn Palace.” I think their effort will be rewarded. 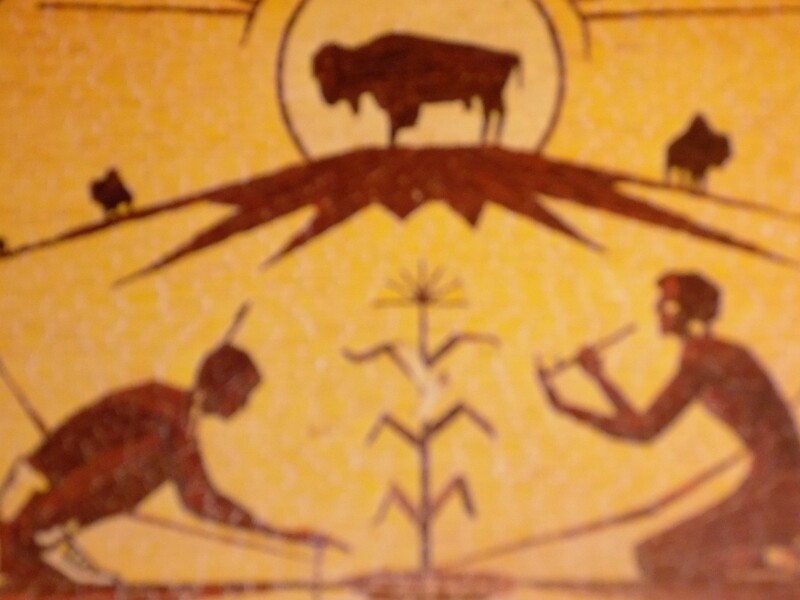 This entry was posted in Uncategorized and tagged Corn Palace, crop palaces, grain palaces, Mitchell South Dakota, Nebraska Theatre Caravan, South Dakota, World's Only Corn Palace on January 23, 2017 by gedwardjourney.